According to a source on ESPN.com, Pedro Martinez and the Florida Marlins are reportedly in the early stages of negotiating a contract to bring Pedro to the young Marlins rotation. To me this would be a fantastic signing for the Marlins who have a very young and talented rotation which could benefit greatly from having a future Hall of Famer join them. The 37-year old Martinez would bring his incredible resume with a career 214-99 record, 2.91 ERA, 3,117 strikeouts and an impressive three Cy Young awards. He would not only bring a world of experience to the club, but specifically playoff experience which would be crucial to an organization that I believe will win the NL East this upcoming season. I have always been a huge fan of Pedro and would love to see him on a team like the Marlins who are so young and so talented with a great chance to make a lot of noise in 2009. “The Diamond Cutter” will keep you updated on this story as it progresses. As we lead up to both the start of the 2008 season and our “Diamond Cutter” top 100 prospects list, I will be taking a look at the top five prospects from every single Major League team. Each team will have its top five prospects along with a brief scouting report on each player that I have pulled from my scouting notes. 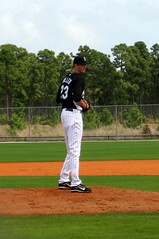 Today I touch on our next team in the NL East with the pitcher deep Florida Marlins. As always, let me know how you feel about the rankings in the comments section below or via email. 1.) Cameron Maybin, OF: Maybin has a lighting quick bat and long arms that can generate a lot of power. Also due to his speed and stellar base running instincts, he’s a prime 30/30 candidate. Great range and powerful arm in center field which is perfect in Florida (entire “Prospect Spotlight” scouting report). 2.) Chris Volstad, RHP: Volstad is a tall, lanky righty who is a groundball pitcher with a low-90’s sinking plus fastball to go along with a plus curve and very strong changeup. Very good make-up on the mound with great control of his pitches. Needs to find a way to finish hitters off better as he tends to struggle with this. With some tinkering in approach could be a frontline starter very quickly. 3.) Brett Sinkbeil, RHP: Sinkbeil has the make-up to be a very good Major League pitcher but has been continually plagued by injuries. 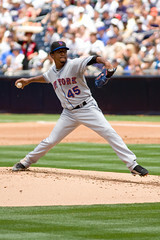 He has a strong fastball and a plus slider and if he can stay healthy should make a nice starter for the Marlins. 4.) Ryan Tucker, RHP: Tucker has a strong mid-90’s fastball and a developing change-up. It’s iffy now on where he will place on a staff as he could be either a starter or a reliever at this point. Needs to work on picking up a good third pitch. 5.) Gabby Hernandez, RHP: Yet another right handed pitcher in the top five brings us Hernandez with a hard fastball and improving change-up. Has a nice build and is developing nicely in the Marlins organization. When the New York Mets selected right handed pitcher Mike Pelfrey with their ninth pick in the 2005 draft, the Detroit Tigers (picking tenth) could only be some what disappointed as they saw their top pitching target whisked off the board only one spot before them. After all, there was a fresh out of high school center fielder who “Baseball America” dubbed as the “most promising available outfielder” and “third-best hitting prospect overall” that had miraculously dropped to them. 18-year old Cameron Maybin had dropped much lower than he should have due to the fact that speculation was running rampant that the would be difficult to sign and was looking for a massive bonus. This didn’t stop the Tigers. History: Cameron Maybin played his high school ball at TC Roberson High School in North Carolina and proceeded to etch his name in not only the school’s history books, but the state of North Carolina’s as well. While holding numerous records at his high school, Maybin also holds the state record for hitting after ending his high school career with a batting average over .600. Maybin also collected a couple of awards including “2004 Baseball America Youth Player of the Year” and “2005 1st team High School All-American Outfield.” Needless to say this garnered the youngster a lot of attention from pro scouts and made his decision to enter into the draft and fore go college a whole lot easier. Once all of the contract drama was put aside, the Tigers now needed to see how the young center fielder handled himself as a pro. In 2006 (after missing 2005 due to the contract hold out), Maybin finally took the field for the first time as a professional baseball player with the Class A West Michigan Whitecaps. 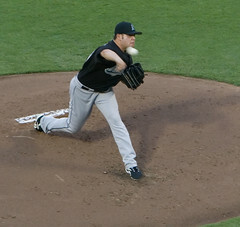 He helped lead the Whitecaps to the Midwest League championship and in doing so was given “2006 Class A Playoff Performer Award” by MiLB.com. In 2006 Maybin put up some very solid numbers for his first professional season hitting .304/.387/.457 with 59 runs, 9 homers, 69 RBI, and 27 stolen bases. Scouting Report: Maybin has a lighting quick bat which can generate a lot of power and because of this I project him to easily be a 30-plus home run hitter down the road for the Tigers. But because of his size, along with his uncanny power is his enlarged strike zone. 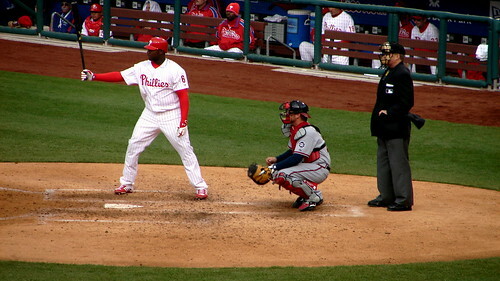 Maybin’s swing can at times be a little long with those lanky arms and can have some troubles with breaking balls. While this has improved a lot, it can still pose a problem at times and contributes to his high strike out rates. With his speed and stellar base running instincts, it’s not out of the question to think of him as a potential 30-plus stolen base threat as well. When you combine his offensive threats along with his great range and powerful arm in center field, you can easily see why I think he will be one of the brightest stars by the start of the next decade and why this kid is really something special. 2007 should be an exciting season for the Tigers organization and its fans as they get to see another season of the exciting Maybin. After more people have gotten to see the future of the Tigers in action, some comparisons have been made. Some are saying Maybin is similar to Jermaine Dye with more speed or even Torii Hunter with a better bat or even of the Eric Davis mold. In fact his high school coach proclaimed his skills and smarts for the game to be that of Ken Griffey Jr. But when it comes down to it, it doesn’t really matter who you compare this kid to because what is obvious is that he is filled with natural talent. While some players claim to be the “Steal of the Draft,” in Maybin’s case this is very much the case. 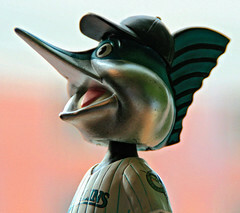 You are currently browsing the archives for the Florida Marlins category.